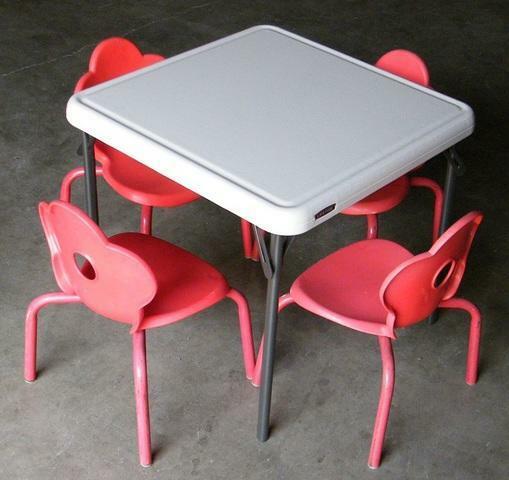 This Kids Table w/ 4 Red Chairs saves you $3 off regular price. Table Coverings Are Recommended due to ware and tear. Tables are cleaned weekly, some cleaning may be required if table was used the night before, the driver will do this on site if needed. If you order without an inflatable a $40 Non-Inflatable fee will be added. Table and chairs are dropped off at closest point of entry. If you want them set up/taken away it is an additional $1.00 per piece. Tables and chairs must be ready for pick up at same place they were dropped off or take away charges will apply.